"Nedal" Band OKILLY DOKILLY Kicks Off "Howdilly Doodilly Tour"
Iron those slacks and use a lint-roller on your favorite green sweater, neighborinos, because Phoenix, AZ's OKILLY DOKILLY - the world's only "Nedal" band - is coming to your town! After finding viral success in 2015 and encouraging positive nods from the likes of The Independent, Time, Maxim, Rolling Stone and countless others, the gentlemen of OKILLY DOKILLY - referred to appropriately as Head Ned, Red Ned, Cred Ned, Dead Ned and Bled Ned - graced fans once again with the November 2016 release of their Billboard-charting full length album Howdilly Doodilly. In the wake of this release, the bespectacled five-piece dropped the official music video for their single, "White Wine Spritzer", which you can check out on KNAC.COM right HERE. 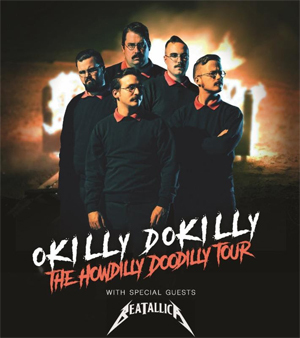 Earlier this spring, OKILLY DOKILLY visited select cities with fellow heavy metal schtik-ters MAC SABBATH and METALACHI, and are now setting their sights on a set of new cities to say "hi-dilly-ho" to! The band kick off their "Howdilly Doodilly" tour tonight in Santa Cruz, CA, will join up with METALLICA-meets-BEATLES cover artists BEATALLICA the following day in Fresno, and visit nearly 40 cities before coming to a stop in none other than Springfield, MO on June 10th. See below for a full listing of confirmed tour dates. Bandleader Head Ned says: "We're really excited to be hitting the road with BEATALLICA this year. Us Neds are big BEATLES fans and we're excited to crack open a fresh John Lemon or Orange Harrison and share the stage with some hilarious neighborinos! We're pleased as punch to be bringing Nedal to so many cities and so many neighborinos across North America!" Established in 2015, OKILLY DOKILLY - the world's first "Nedal" band fully based on Ned Flanders - found success before even playing their first show, becoming a viral phenomenon after releasing just a few press photos and a four-song demo. Within two weeks, the band garnered nearly 30,000 Facebook fans. In 2016, OKILLY DOKILLY independently released their debut record, Howdilly Doodilly, which landed at #4 on the Billboard comedy album chart. The music video for the band's first single "White Wine Spritzer" amassed one million views in a few short weeks, and to date, has just shy of two million views. 2017 saw OKILLY DOKILLY's first lineup change as original guitarist Stead Ned and original bassist Thread Ned found themselves indefinitely interned in the Calmwood Mental Hospital after months of relentless left-handed conversion therapy. New members Cred Ned and Dead Ned have since joined the band's ranks. OKILLY DOKILLY's live shows are high energy affairs that weave between comedy and brutality. It's not uncommon to see fans throwing back white wine spritzers while pummeling and crowd surfing a giant inflatable donut.